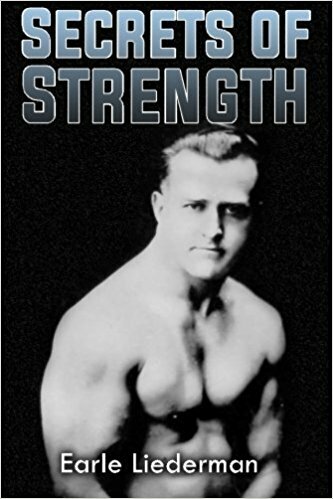 Various brief expressions have been employed to denote the possession of an exceptional degree of strength in a man, such as "his shoulders are broad;" "he has a powerful back;' "a man with such arms must be strong;" and so on. These highly descriptive expressions more or less imply that the man of strength is to be judged by such rules as broad shoulders, or a strong back, or a muscular pair of arms. Granting the necessity of such physical factors, nevertheless, speaking with a hearty regard for facts, it would be more benefiting the truth to mention that the greatest physical feats of which man is capable are performed by the legs. This is true, whether we refer to speed, endurance, quickness, or strength. Whatever the physical task you may mention, and even though the arms apparently do the work, it is in reality the power of the legs, though sometimes in combination with the back and hips, that puts the punch into the effort. This is entirely obvious, to anyone in so far as running, jumping, mountain climbing, skating, and bike riding is concerned, but it may not be quite so obvious in relation to boxing, baseball, football, wrestling and tennis. However consider the question seriously for a moment and you will understand that the power for every arm and shoulder movement which really counts in any of these games starts from the toes. Try to stand absolutely still and make effecting use of a baseball bat or a tennis racket, or try to get stream into throwing a baseball or delivering a punch. Then you will realize the importance of the legs in all branches of athletics. The thigh muscles are the largest an most powerful in the human body, which is the chief reason. If among your acquaintances there is a venerable citizen of three or four score, whose early life was spent out in the open, who now moves about with grace and agility that belies his years, engage him in conversation and ten chances to one he will tell you in a manner, which if boastful is certainly excusable, of the miles he would walk when a few years younger, and of the hard work he was always accustomed to. His legs were always used to hard work, walking, climbing, carrying, lifting, pulling and hauling. You won't find many men of advanced years who look and act younger than they really are, who were always used to sitting or standing still; the man of that type is most likely to appear many years older than he actually is, having broken down with old age long before he naturally should. A close relationship does indeed exist between good solid underpinning and a spry old age; a man will deep pretty youthful and nimble as long as his legs hold out under him, and it is a matter of sound reasoning that the better the condition of his leg muscles before he reaches advanced years, the better they will be when he gets around the accepted time for a man to become feeble and shaky. The man with a strong, capable pair of legs is more apt to possess a straight supple back. It is rare to see a man with a straight back and erect carriage shuffling along with a feeble gait. It is doubtful if you ever encounter such an individual, they simply don't belong together. The jumping ability of an individual has sometimes been used as a sign of the prospective length of life. This may not, of course, be exactly true in the strict sense of the word, but here is no denying the fact that strong springy legs should remain spry and nimble longer than the weak-kneed variety. Regardless of his age in years, as long as a man can get around over the ground with a firm springy step, he is really not old. The possession of leg power will soon seem important when you understand that the man with really powerful legs, also has a really powerful back, and a full roomy chest of great capacity. The man of this type will have a torso covered with firm muscles as it naturally should be, his shoulders will be broad, surmounted by a man sized neck, and his arms are certain to compare with the rest of his physique. 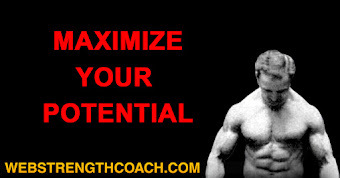 You cannot develop legs of superior strength without developing the muscles of the back and torso. Leg work always stimulates the actions of the lungs and heart, as due to the great size of muscles involved, the bloodstream must be pumped to and from the muscles, and thoroughly oxygenized of all impurities. As a result, the chest is sure to be fully expanded. 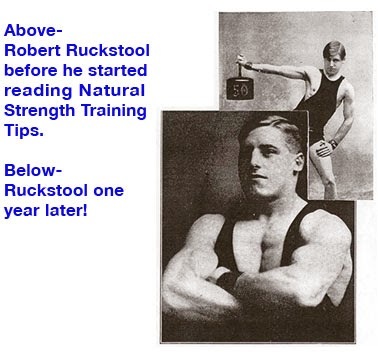 It is known to modern physical educators that leg exercises of a certain type are the most certain means of acquiring a chest of magnificent proportions. 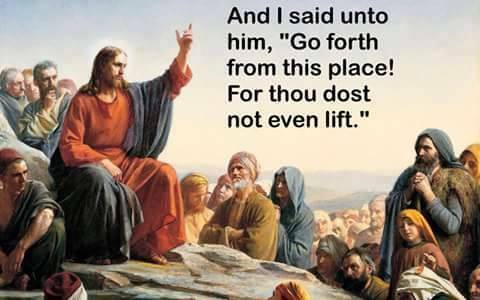 This explains the big advantage the bar bell user has over the followers of light exercise methods and gymnastic work. As a simple experiment to prove this contention, try waving your arms around a dozen times with a book or light object in each hand; then make a dozen repetitions of a deep knee bend, and see which movement causes you to breathe deeper. When dressed on the street, it is true there is not much opportunity to display or give evidence of your possession of good legs. 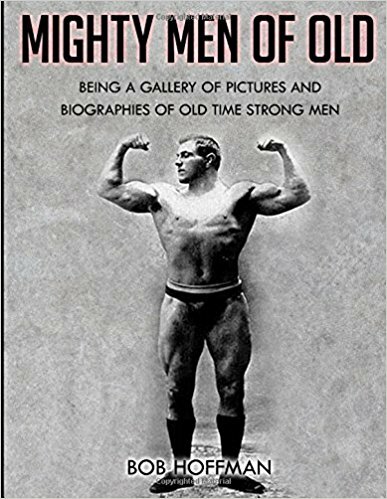 Great breadth of shoulders and or a size seventeen neck may impress people; it may also be easy on the street to distinguish the size and shape of a wonderful chest; but did you ever notice the magnetism in a walk of a dominant, energetic man? His step is firm and elastic, his shoulders are drawn back and his head is erect looking the world in the eyes. The dominant man, a leader among men, is strong and vital. The legs have a lot to do with the personality and the man with the firm step and erect carriage will leave a lasting impression in your mind, while the man of shambling gait passes out of your memory. The latter is generally shiftless and of the "spineless" type, a weakling with no aim in life always taking the orders of others: he slouches along, eyes downcast. One man has backbone, the other hasn't. The man possessing powerful legs should also have strong powerful buttocks and back muscles. There is said to be a close connection between firm, well knit buttocks muscles and virility. When the muscles of the buttocks and the region of the loins become soft and flabby, the virile powers of manhood are waning. The muscles of progression form a powerful chain of vital energy; the legs are most important in this wonderful chain, and we should always consider the legs as a unit in this chain. The leg power requires a complete development of all the leg muscles, so there is no reason for dwelling upon the subject of developing one part of the legs at a time; the proper way to do the job is to practice a number of movements designed to bring out the combined strength and muscularity of the legs as a whole. Furthermore, the legs must be exercised in conjunction with the muscles in close proximity. The muscles of the front of the thigh must be connected to strong abdominal and waist muscles, and the shin muscles on the front of the lower leg must be strong to hold the feet firm. The thigh biceps must be connected to equally powerful buttocks muscles on one end, and almost run in a continuous chain down the calf to the tendons of Achilles. Your program of training exercises must embrace movements designed to work the muscles in groups such as we just mentioned. Legs thus developed cannot be otherwise strong and full of power. Sometimes walking is referred to as an ideal exercise for the legs, but in walking he legs are not given a wide range of movement. In running, the range of contraction and extension is more complete, but even there it is not complete enough. In order to better explain just what I mean, permit me to give you an example. Probably you have noticed an aging man who found it most difficult to get up on his feet from a sitting or kneeling position. Many men of advanced years are quite capable while on the feet, but find it extremely difficult to get up and down. Walking is a splendid leg exercise, but just such a condition as this results from confining the leg exercise to walking and running. To properly preserve the use of the leg muscles, we must regularly practice movements requiring complete contraction and extension of all the leg muscles, but principally the great extensors on the front of the thighs. Such movements will also strenuously involve the action of the calf muscles, especially when a fair variety of leg exercises is your policy. Lacking such movements calling for complete action, the muscles will later in life waste away and lose all for of springiness essential to youthfulness. The wasting of the thighs and lack of springiness in the calves are sure signs of physical decline and always accompany old age. A small amount of observation will convince you of the necessity of something more complete in action; if the thighs especially are to preserve the desirable elasticity of youth. Observe different individuals walking; even in the most exaggerated walking motion you can find, the thigh muscles move in but a small degree of their complete range. Likewise the calf, ideally adapted to hiss or mountain climbing where the heel must be raised to the limit in adding to the force behind the thigh lacks the proper action in walking on the level. The foregoing stresses the importance of leg strength in preserving youthfulness. The athlete who must keep at the top in this chosen branch of sport will sooner or later realize the importance of preserving strong and springy legs. The necessity of taking proper care of the legs is realized and recognized by coaches and trainers in all athletic lines. Athletes begin to hit the toboggan slide on the down grade to oblivion when the legs go back on them. Pugilists, ball players, tennis players, runners and jumpers alike know that their athletic longevity depends upon keeping he legs young more than upon any other muscular factor. The reason for connecting leg strength with ruggedness will be apparent when you have properly considered the true importance of all of the above. Ruggedness implies the ability to withstand hardship of any nature, to be rough and ready in any emergency calling for physical combat or unusual physical effort. The rugged man is he who can tramp all day over rough land carry gun and pack and be ready the next day for the same sort of journey; or in boxing, the rugged man can stand up toe to toe and exchange punches with his opponent; take everything the other fellow has to offer and still be handing out the worst punishment. In wrestling, the rugged man can rough it up without let up; athletes generally get out of the woods or mountains, working or tramping to cultivate the quality of ruggedness. When you thing of ruggedness seriously, you don't think or arm of shoulder strength; anyone who knows anything of physical training would laugh at the idea of developing ruggedness by waving the arms about with light dumb bells in the hands. Such foolishness would only be a waste of time, and won't even satisfactorily develop the arms and shoulders. Ruggedness implies the power of the legs to keep pushing ahead with powerful strides when the going is rough, to be able to keep the feet under any difficulty. Whether or not the arms weaken and the shoulders grow too tired to raise the arms, the rugged man has legs equal to carrying him forward. The only way to develop the quality of ruggedness is to strengthen the legs to the last degree. When the legs have been so strengthened that no reasonable force can prove too great a resistance, the man can believe himself to be strong and the general tone of all his physique will be of such high quality as to make perfect health a certainty. Leg strength and ruggedness will prove valuable assets to the man whose business never makes it necessary to tramp over rough terrain or engage in personal combat. Business and professional duties sometimes become so trying that a man must keep going hour after hour, without rest and hardly any sleep. Success then shines upon the man who does not falter, but sees the crisis safely through. For general good health and physical efficiency accompanying powerful legs gives to any man, whether business man or athlete, the reserve which enable him to keep going in times of extreme stress. A man who walks in a spry and energetic manner is possessed of physical buoyancy and reserve aplenty; the regular practice of walking in such a manner should help preserve the spirit of youthfulness, but something more than walking is required to develop and reserve such buoyancy. One must develop the strength necessary to keep the weight of the growing heavy with advancing years. Light exercises certainly can't do it, as the large muscles of the legs are intended for powerful exertions. Nature has so placed them as to make the man capable of carrying, pushing and pulling heavy objects, and to be able to lift such heavy things into proper positions for handling. The addition of light weights held in the hands cannot materially add to the work placed upon such powerfully constructed muscles. The lifting feats of famous athletes will prove to you the immense powers hidden in properly trained legs. 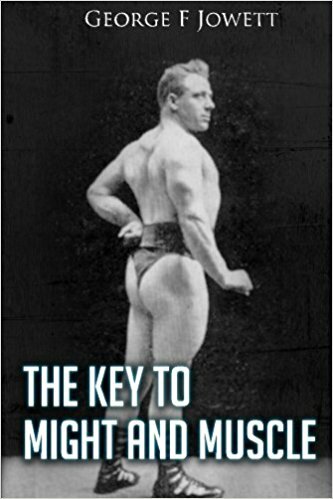 By the time you have read through this volume, you will better understand the possibilities of developing leg strength. You wouldn't expect to train for a marathon race by taking a slow stroll along the street; nor to train for a hundred yard dash by jogging the length of a city block. Merely for the reason that such races as the marathon and the hundred yard dash call for quality training to develop the powers required in such contests. You know very well that light work wouldn't prepare you for any athletic event. Nothing but hard training would be of any use. Well, in the same way the legs can only be strengthened and put in good condition by giving them hard work. You have to use good solid resistance, which is best furnished by use of weights. The beginner at bar bell exercise should not expect to start immediately on heavy work, nor must he think of practicing difficult movements at the very first. The bar bell should be loaded to something like thirty-five to fifty pounds for the beginner. The former figure for rather weak individuals and the latter poundage for men of average health and strength. It will be essential for his to begin on simple movements with rather light weights; then as become stronger and the muscles have started to show definite results, you progress form simple squatting and bending exercises with light poundage to the same movements with heavy weights. 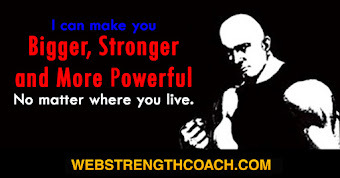 After the first two or three months, your program must include a variety such as the following; for the big extensor muscles of the thigh, the deep knee bend, the straddle lift, and the dead weight lift with two hands, and the leg press, which is valuable for the biceps muscles on the inner side of the thigh; for the last named purpose you may also practice the exercise of raising a bar bell from the floor to your thighs while keeping the legs straight. Advanced movements of this nature consist of some of the following; the leg curl, another valuable exercise for the small of the back, buttocks, thigh biceps, and calf consisting of holding a bar bell on the shoulders and bending forward at the waist while keeping the knees stiff; weights may be tied to the feet and a leg curl in an erect position may then be practiced. For the extensors of the thighs, some of the best advanced stunts are Roman Column and Roman Chair work, which also get the abdominals at the same time; the Roman Board described herein is also splendid. For the muscles of the lower leg, first start with rising on the toes while holding weights in the hands, or on the shoulders; then later on practice walking and hoping around the room on tip-toes while holding moderate weights; walking and running upstairs with a bar bell on the shoulders is very good. To properly exercise the calves it is necessary to give them a great amount of resistance to overcome. Due to the construction of the foot, the lever formed by the foot and leg bones place a strain equal to three times the bodyweight upon the calf muscles. Here you have an explanation of the failure of light exercises for the building up of these muscles. The muscles on the front of the lower legs, commonly known as the "shins" will be given valuable exercise, if you practice leg bending movements with the feet flat on the floor. Two essentials of leg exercise which we must not fail to consider of importance might be briefly described as combining the leg work with strenuous exertions of the arms and upper body as the one essential; overhead lifting, especially with quick lifts and pressing in the Continental and bent press positions will prove of value in combining the arm thrust with complete contractions of the leg muscles. The legs become more useful when trained in this manner. Observe that in such popular athletic pastimes as baseball, basketball, tennis, boxing, and in shot putting and throwing the hammer and javelin, the legs are used in conjunction with the arm thrusts. The legs also acquire extra strength and become more useful if the idea is followed of giving them a certain amount of work which we might term as "working the muscles from the opposite direction." Examples of this are Roman Chair, Roman Column, and Roman Board exercise, the leg curl, and two exercises we mentioned wherein the knee are kept straight while the body is bent forward. 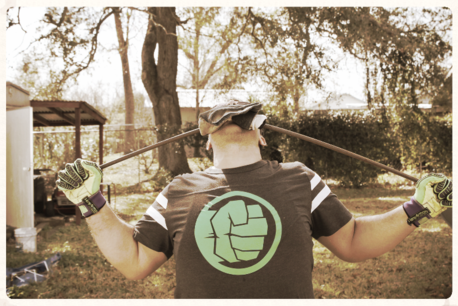 Nothing can compare with these essentials in making for muscular coordination. The close student of advance physical culture should be interested in the conformation of the leg muscles denoting the greatest strength and leg power. As to the calves, they need not be so large for the production of pure strength if the man is not required to move about very much. However, in climbing grades, or getting over the ground as rapidly as possible while handling heavy objects, exceptional calf development is of prime importance. Tall, slender men require a calf development to properly handle their own bodyweight, but if the muscular bulk is light compared to the height and framework, the man would possess a relatively small amount of bodily power and would not be expected to handle exceptionally heavy things. Overhead lifting does not necessarily require large calves, but dead lifting from the ground and pushing and pulling heavy objects dies call for high quality calves. Refer to photographs throughout this volume for example of first calf development. Still, the properly developed calf does not round out into the same shape on all men. It seems obvious there must be various types of calf development according to individual physical types, each of which may possess great strength and quickness. The calf size and shape is controlled by many factors, such as the relative lengths of the lower and upper leg bones, the total length of the foot, the length of the heel, and the development of the muscles on the back of the thigh. On the man of relatively slender proportions, the calf may be of the long, tapering sort of build, the largest girth being but a short way below the knee. This type of calf may be just as strong or stronger than the extremely bulging type, as the bulk of muscle may be there, which is required to properly handle the body, but the greatest bulk of muscle is not concentrated appropriate to a large measurement of the most pleasing shape. However, you will not find the strongest calves in this class, nor will you find it among sprinters. The limit in size to which the calf may be developed in controlled by the bony conformation of the foot and lower leg. Possessing a certain type of leverage, the calf is of proportionately large size. Another type of leverage makes great size of calf unnecessary for ordinary movements. The type of thigh possessing greatest strength has a great muscular bulge on both sides just above the knee; also a full rounded curve on the back of the thigh. For this reason, the thigh measurement does not always serve as a satisfactory means of judging comparative leg strengths. The muscles just above the knees best serve the purpose of extending the leg when bent at an acute angle, as in performing a very deep knee bend, a vigorous contraction of these muscles is essential to raise the body from the low squatting position. High class lifters are always in getting a low position under the bell regardless of which of the active overhead lifts they may be performing. Moreover, the muscles just above the knees serve you best when considerable climbing is necessary, in the action of continually locking the knees. At such times, good calf and knee development is of greater importance than a large measurement just below the buttocks. It is for this reason that some exceptionally strong men have seemingly poor thigh measurements. Some classes of lifting and exercising will produce a large measurement of the upper part of the thighs; as back, harness, and hand and thigh lifting, where the legs are bent to only a slight extent. Truly, the well balanced thigh would be developed by combining this latter class of lifting with full squat exercises. Although the legs are generally recognized in all forms of active athletics as of major importance in the physical make up of man, nevertheless body culturists of all classes pay too little attention to the lower limbs. 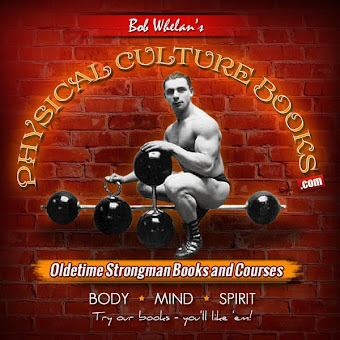 When we refer to body culturists, we mean physical culturists, gymnasts, physical training students and directors, and in fact all those who make a special effort to develop the muscular system. There is, indeed, a common inclination to place altogether too little importance upon the thorough muscular development of the legs. A simple example of this may be observed in the popular attempt to permanently enlarge the chest by arm movements with light resistance. Even a slight attention to athletics will show the observer that the greatest endurance and sustaining powers will be found among the man who use their legs most. Endurance is not by any means chiefly dependent upon the training of the leg muscles to run long distances. Something altogether different takes place; which requires and explanation of considerable length. The leg muscles when brought into proper use as a unit, require the coordination of the buttocks and certain of the back muscles. These muscles being by far the largest group in the body, when brought into active play, call for an increased exchange of carbon dioxide and oxygen; which in turn demands and acceleration of the functions of circulation and respiration. The lungs work more efficiently and the bloodstream is kept in a state of greater purity when the chest is full and deep. Physical exercise calls for a greater size of the chest to make room for the lungs; consequently the demand of muscular activity for increased lung power brings about an expansion of the chest, which if the exertion is repeated frequently enough, will become permanent. Now you may understand why leg work is so closely linked with lung power and endurance. The largest muscles of the body are certain to call for greater power on the part of the circulatory and respiratory functions. It is, of course, necessary to build up the muscles surrounding the chest cavity, by means of special developing work, and although such development will result in an increased measurement of the chest, the greatest natural expansion can only be expected by employing the natural bodily functions directly involving the vital organs enclosed in the chest.